CHARLOTTE — Spartan Motors Inc. (Nasdaq: SPAR) reported net income of $247,000 or 1 cent a share in the second quarter ended June 30, down from net income of $691,000 or 2 cents a share in the second quarter of 2013. Revenue was $115.8 million, down from $120.9 million in the second quarter of 2013. For the six months, Spartan posted a loss of $1.9 million or 6 cents a share, vs. a loss of $3.7 million or 11 cents a share in the first half of 2013. Revenue was $243.8 million, up from $217 million a year earlier. Among sectors of Spartan’s business, delivery and service vehicles posted an operating profit of $1.7 million in the quarter, vs. an operating loss of $1.6 million a year earlier. Emergency response posted an operating loss of $1.5 million, vs. operating profit of $400,000 a year earlier. And the specialty chassis and vehciles business posted an operating profit of $1.4 million vs. an operating profit of $3.9 million a year earlier. The company’s order backlog increased to $246.7 million at June 30, up from $242.7 million as of Dec. 31. CFO Lori Wade said the company was revising its 2014 revenue projection to a range of $500 million to $520 million, a reduction of $5 million from the upper end of the range. The company also revised its expected operating margin for 2015 to 0.5 percent to 1 percent of sales. 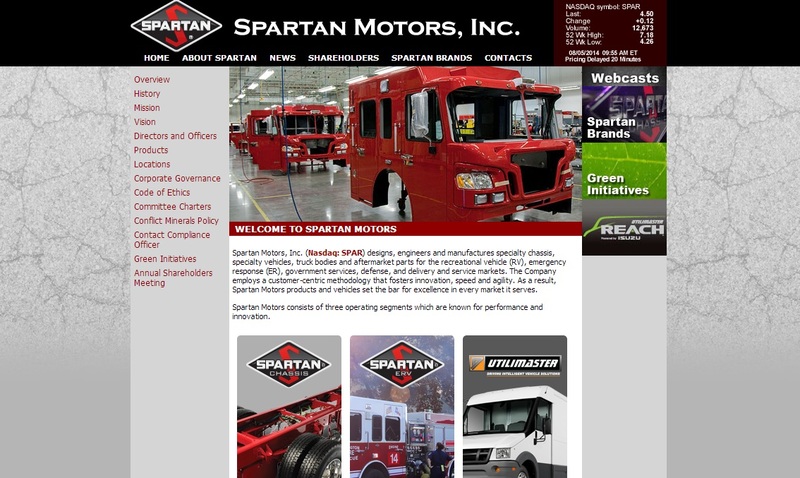 Spartan Motors designs, engineers and manufactures specialty chassis, specialty vehicles, truck bodies and aftermarket parts for the recreational vehicle, emergency response, government services, defense, and delivery and service markets.